Audi AI is a term that will be synonymous with autonomous driving. It represents the platform on which Audi’s software and hardware communicates with the environment and eventually will be developed to achieve fully autonomous control, even at high speeds. 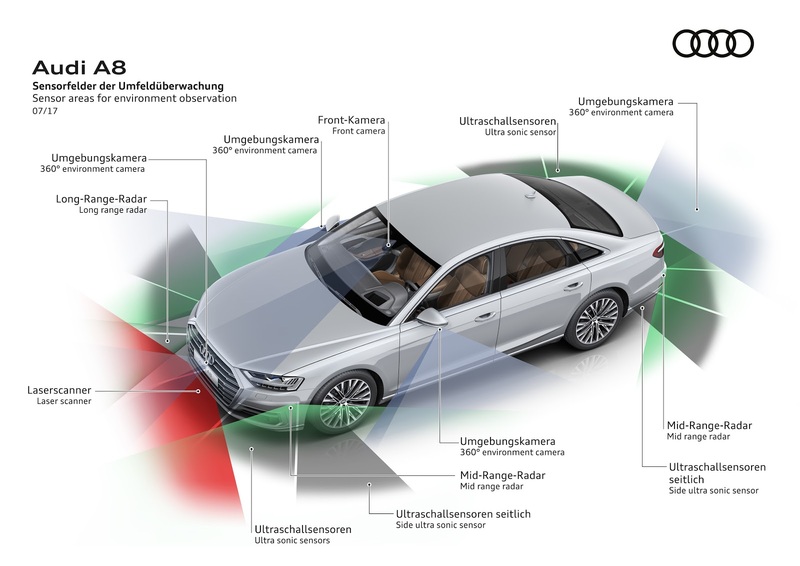 Today, Audi AI is demonstrated by Audi Traffic Jam Pilot whose system can operate the vehicle without driver control at speeds up to 37mph (60kph) by using a multitude of radars, cameras, and, in an automotive first, a laser scanner. At long last, no driver intervention is necessary in one of the most stressful and unproductive situations of the commute. Audi intends for you to enjoy your drive no matter if you’re stuck in a traffic jam or on the open road. The new interior carries a first class, business like interior trim with few differing surface textures and mainly horizontal character lines. Compared to the multitude of surface textures and curves of the Mercedes S-Class layout, the difference is remarkable. However, Audi’s layout doesn’t look overly simplistic or lacking unique design as can be a criticism of the new BMW 7-series. Nearly all buttons have been removed, replaced by dual touch screens with haptic feedback, presenting a clean and minimalistic design. The steering wheel may be the most dramatic shape and it seems to have drawn inspiration from the front grille. It works. The rear passengers continue to receive more attention and additional luxuries as sales in the Chinese market, where customers prefer being chauffeured, continue to increase year over year. New for the A8, the rear passengers use a touchscreen panel to control infotainment and navigation, along with the expected climate and seat position controls. The extra 5.1 inches of the A8L affords a heated and massaging footrest built into the front passenger seat back. Ensuring that all occupants receive a smooth and controlled ride is an active suspension system, powered by the mild-hybrid 48V electrical system. It utilizes a forward view camera to map the road ahead for surfaces changes and will predictively adjust the suspension to minimize shock to the cabin. Artificial feedback is sent through the steering wheel to maintain a sense of road feel. Not just using the 48V technology for efficiency and dynamic gains, the system allows for split-second adjustments to improve force distribution in the case of a side impact. The system even utilizes information obtained via the surrounding sensors to raise the suspension in case of an impending side impact, thereby transferring forces through the most rigid cross sections of the chassis. Electronic all-wheel steering and a sport rear differential will be optional features. 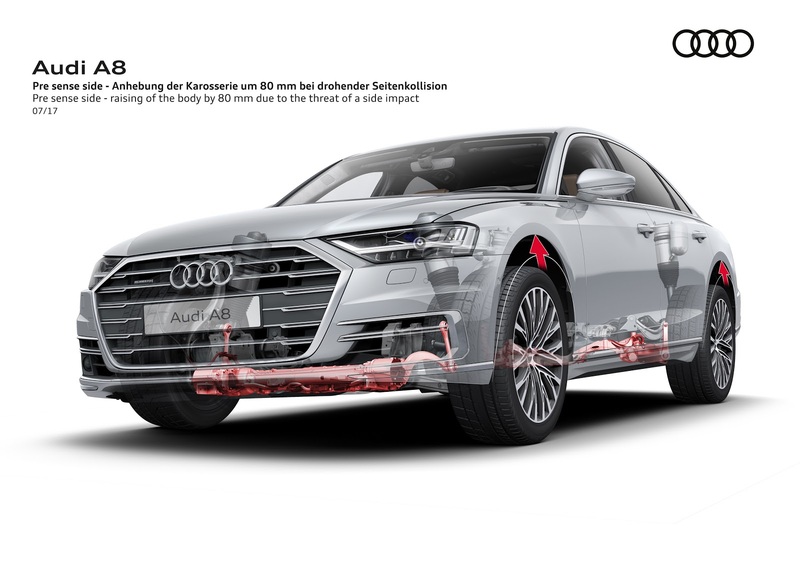 All A8’s feature a belt-alternator-starter which allows for engine-off coasting, seamless engine start-stop, and energy recovery, helping charge the 48V electrical system. 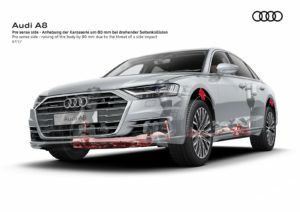 Stay tuned for the A8L e-tron where this plug-in version will achieve about 30 miles solely on electricity but the big news is the wireless charging capability. 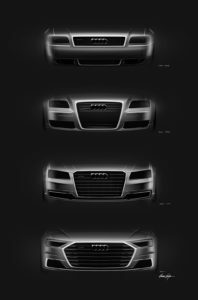 Modern Audi’s have all featured evolutionary styling changes, so when Audi announcing its latest model would feature its new progressive design language, there was a lot of anticipation. 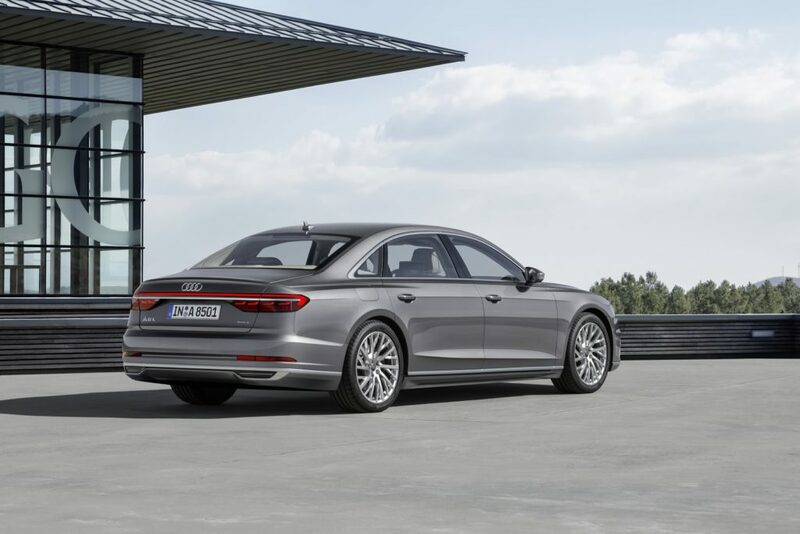 At first glance, the A8 doesn’t represent any sort of great leap in styling, however, in typical Audi fashion, the details are what makes this design special. The front end features a vertical, new single frame grille that is lower, wider. It’s surrounded by optional matrix LED headlights featuring distinctive daytime running light pattern. 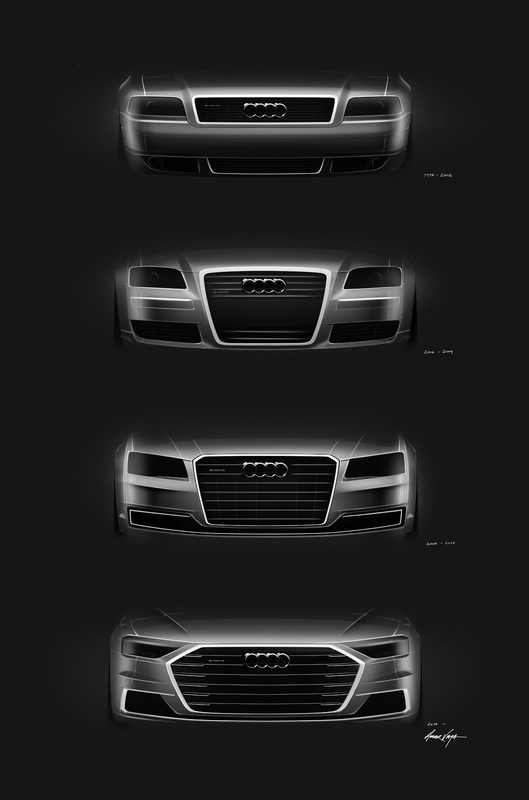 The side view features the most significant departure from previous Audi designs. The shoulder line has been lowered so it now resides between the wheels. For the past 30 years, this line resided above the wheel arches. This shift allows for a lower stance and room for muscular lines above the wheel arches that emphasize Quattro, as put by Marc Lichte, Head of Audi Design. The sharp line below the belt line (window line) is impressive in it’s depth and sharp definition and it visually leads around to the rear to the sloping and curved trunk lid surface. The OLED rear lights are thin and wide and are separated by a thin strip of chrome, again the horizontal line theme is ever present. The lights in the front and rear become animated when the vehicle is locked and unlocked. The result is a high-tech while classy as it’s currently unique in the market. Note the biggest departure from previous Audi design is the feature line that begins at the top of the front wheel arch and continues along the entire side of the car, emphasizing Quattro. 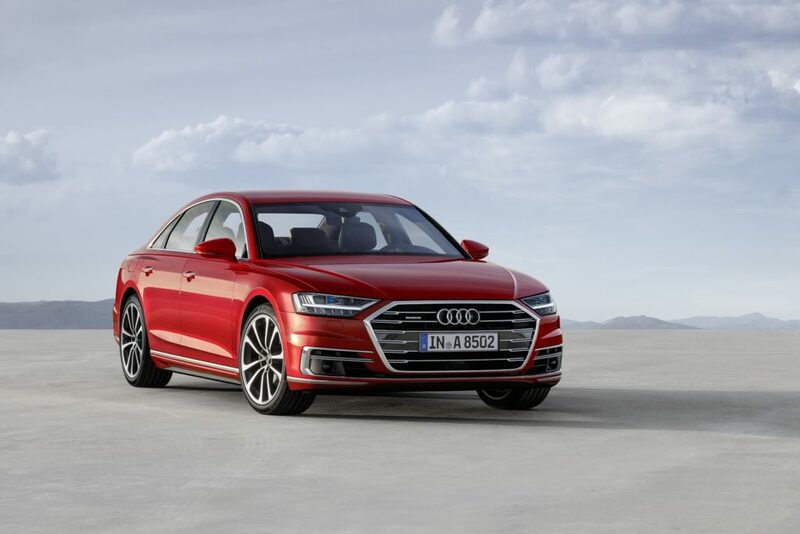 The new, 2019 Audi A8 carries on Audi tradition of progressive design. The minimalistic interior carries some risks as it requires a robust and fast acting software to ensure functionality, however, the design hits its mark. The exterior will be most appreciated by those who look for the fine details instead of the dramatic shapes. The predictive adapting suspension, the 48V mild-hybrid system, and Audi AI are technical leaps over the existing field of competitors. Carrying the newest design theme and massive integration of technology, the new A8 represents a holistic view of the future of Audi.